Business industry experts, entrepreneurs, and change-makers gathered to share, connect, and network great ideas and interests in the first ever Collaborative Carnival. With the aim of bringing together the best thought leaders from all over the world and start-ups from various industries, Impact Hub--a network of entrepreneurs--and Social Play and Innovation Network (SPIN), a platform where a group of professionals solve social problems through enterprises, collaborated to create a one-of-a-kind event for entrepreneurs. They have taken the typical seminars and forums to another level by engaging its attendees to a diverse field of business topics and specialized workshops for their business needs. Guests get to experience a networking festival at its best. 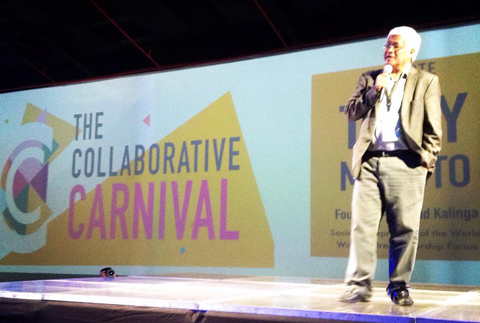 The Collaborative Carnival, which was held at the Green Sun in Makati, was the first ever gathering of impact entrepreneurs in Asia. This three-day event featured interactive panels on various topics such as social entrepreneurship, people engagement, basics of business, fundamentals of Public Relations, and digital media and design; breakout sessions; workshops; a concert; and lots of networking sessions. World-renowned speakers like Tony Meloto (founder of Gawad Kalinga) and An Xiao Mina (co-founder of Civic Beat) were also present to share their experiences and thoughts about the power of collaboration and social media. "Our goal is not to develop single entrepreneurs, but an entrepreneurial culture where young people can have an entrepreneur mindset," shared Meloto. Interactive discussions were also done to encourage attendees to take into action the knowledge they have acquired in the said event. It's not just a sit-and-listen type of seminar but an action-oriented one that involves the participation of attendees. Panels have also stressed the value of entrepreneurship in the Philippines, that Filipinos can make a difference in the society. "We have to keep building the ecosystem because it's not just the profit that drives a business; it is the vision and the people behind it," explains Ces Rondario, co-founder of Impact Hub Manila. With this collaborative movement, the Philippines is truly on its way to be on top in terms of economy.